The Omega J8006 Nutrition Center Juicer in black and chrome is a masticating, low-speed Omega juicer that maximizes juice enzymes and makes fresh juice last longer. The dual-stage system first extracts the juice from fruit and vegetables, then squeezes the pulp to extract even more juice. The juicer is easy to use and powerful, even though it operates on low speed. The low speed aspect means that it keeps the healthy qualities of the juice in tact. Aside from making delicious, healthy juice, the juicer can also be used to create nut butters, baby food and soy milk. It’s also useful for grinding coffee and spices, and mincing herbs. If anything goes wrong with the juicer, you can use the 15-year warranty to replace the parts of the juicer as a whole. The Omega J8006 Nutrition Center Juicer is very easy to use. The low speed doesn’t mean it doesn’t work quickly – it does! It’s great that it juices everything twice (first the actual food, than the pulp) and that it also ejects the pulp so you don’t have to stop midway through juicing to clean it out. It doesn’t get clogged with pulp, either. As long as you disassemble the juicer after using it and rinse off the remaining juice and pulp, it’s easy to clean. If you don’t want to wash it right away, just rinse everything off and let it soak in a bowl of water until you’re ready to wash it. Thanks to this juicer’s low speed, the juice’s healthy enzymes are still intact. The juicer also prevents oxidation and lets juice be stored for up to 72 hours without losing its health benefits. This juicer’s performance is excellent. It makes great fruit and veggie drinks, plus it helps make other seasonings, snacks and more. It can grind whole coffee beans, mince herbs, make soy milk, create nut butters and make baby food. This is a very quiet juicer. To make it even more quiet, put it on a dish towel on your counter, which will reduce the noise. Since the juicer doesn’t really create heat, it’s safe to put it on the towel while juicing. The dual stage processing system ensures that the highest amount of juice possible is yielded from fruits and vegetables, plus wheatgrass. What You Get in the Box: The juicer comes with a guide for making great drinks, snacks and other foods. 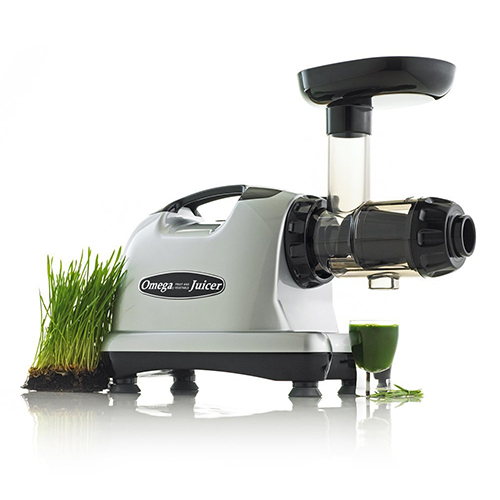 This is an excellent juicer for making healthy, fresh fruit and veggie juice, plus wheatgrass juice. It lets you make a lot of juice at once and you can store the juice for a long time. The dual-stage processor makes sure that the maximum amount of enzymes, nutrients and vitamins are left in the juice. It’s also really great if you’re looking for a sort of food processor and coffee grinder, too, since it has additional capabilities that most juicers don’t have. Overall, it’s an excellent buy, especially if you don’t have a lot of kitchen gadgets yet.